We love our music department! 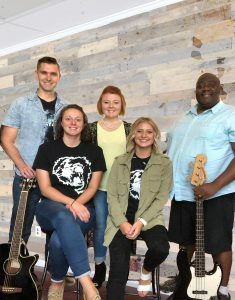 Under the leadership of Music Director, Samantha Garman, the band creatively commands an atmosphere of expectancy and faith every time they step on the stage, and they have a heart of worship both on and off the platform. This is a group of individuals that truly believes that God invades the praise of His people and that every sound has significance if made in Honor of the King. They refuse to take any service for granted! Link your faith with the team and encounter Heaven touching earth!